Ever wondered what’s on offer throughout the East through British Showjumping? Keen to start jumping but not sure where to go? Want to find out more about the region’s top riders and their advice for succeeding in this sport? The our May edition has all the answers for you! 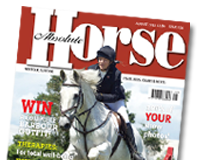 With top rider interviews with Phil Spivey, Laura Renwick, Rachel Stanley and Daniel Moseley, we also have advice on jump training and saddlery options, plus advice from Saracen Horse Feeds on how to feed your hard-working horse.